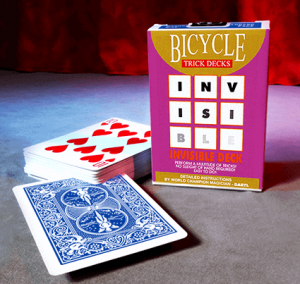 Invisible Deck Card Trick Review: The Best Card Trick…Ever? In an earlier post I briefly mentioned why I think The Invisible Deck is the best quick and easy card trick you could buy. In this magic review I will be discussing in more depth why this product is quite possibly the best and most versatile card trick ever released, as well as where to buy it from. What is The Invisible Deck? The Invisible Deck is a card trick, first things first. However, it can be used within most areas of magic. A card mechanic might use it to show off his uncanny skill with card manipulation, or a mentalist may use it to display proof of their psychic abilities. It is extremely flexible in the way it can be presented- the sky really is the limit. The most common presentation of the Invisible Deck, however, usually goes something like this. The magician asks a spectator to think of a card (completely in their head). 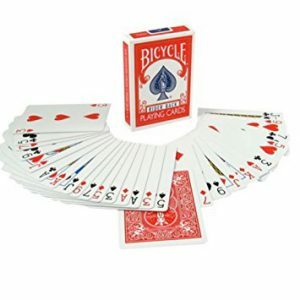 He then asks her to imagine she is holding an invisible deck of cards, and that she removes the card she is thinking of from the invisible deck. 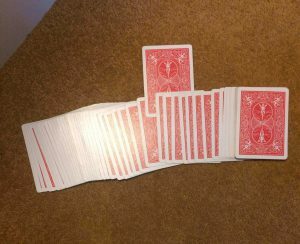 He then asks her to turn over the card, so it faces the opposite way from the rest of the cards in the invisible deck. If she’s done it correctly, she should be holding an invisible deck in which the card she (and only she) is thinking of is turned face down. The magician will then ask her to ‘hand over’ the invisible deck of cards. He then puts the invisible deck of cards inside his pocket. After a moment, and perhaps a few magical words, he puts his hand back into his pocket and pulls out a real pack of cards. The audience may laugh at this point, wondering if the whole thing was just build up for this gag- because he obviously must have had that deck of cards in his pocket all along. There’s no way it’s the same deck as the spectator was imagining, right? There’s only one way to check. If this deck really is the invisible deck the spectator was holding, there should be one (and ONLY one) card face down within, a card only the spectator knows. The magician asks, for the first time, what card they were thinking of, so that everyone can hear. The spectator names their card- let’s say it’s the Nine of Diamonds. The magician, very slowly and fairly, removes the cards from the deck. He spreads through the cards. One card is face down. He removes it. Any guesses what card it is? Yes, impossibly, it is the spectators card. How on earth is this trick easy? The truth is, despite how it may sound, this trick is very, very simple to perform. All it requires is a passing knowledge of maths, and the ability to create a great presentation. I won’t go into the minute details of how this trick works; it isn’t my trick to reveal, but if you still aren’t confident it really is as easy as I say, check out what other people have said about it on Penguin Magic. My personal favorite way to use The Invisible Deck is within a ‘lie detector’ style trick. First of all, I get them to physically pick a card, and then I ask them a number of questions about the card, asking them to say ‘no’ everytime. I might ask things like ‘is your card red?’ after which I tell them whether I think they are lying or telling the truth, perhaps pointing out some facial twitches that gave it away (naturally, I know the card they have chosen already). Gradually I narrow it down to a few possible cards, and finally guess it correctly, much to their annoyance and bewilderment. After this, I up the ante by having them just THINK of a card inside their head; this way they KNOW that if I do end up guessing right, I really must be able to tell when they are lying or telling the truth. I also tell them not to say anything this time, and that I will be relying completely on their body language. I rattle off all four suits, and say each number (including Jack, Queen, King and Ace) out loud. At no point do I tell them what card I think it is (I genuinely don’t know at this point), instead frowning, as if this is difficult. At this point I will tell them that I think I know what card they are thinking of, and that I am going to face away from them and turn over a single card in my deck; which will be my prediction. I do nothing of the sort, instead taking out my Invisible Deck and pretending to turn a card over. I turn back to them, and ask them to name their card for the first time. Once they’ve done this, I spread through my Invisible Deck and reveal that there is one card face down- when I take it out, it really is their card. Here’s a video of David Blaine seriously freaking someone out using the Invisible Deck. How much do I have to shell out for this great trick? Here’s the good news: this trick is literally one of the cheapest on the market. Crazy, right? It goes for under £10 at most magic shops. 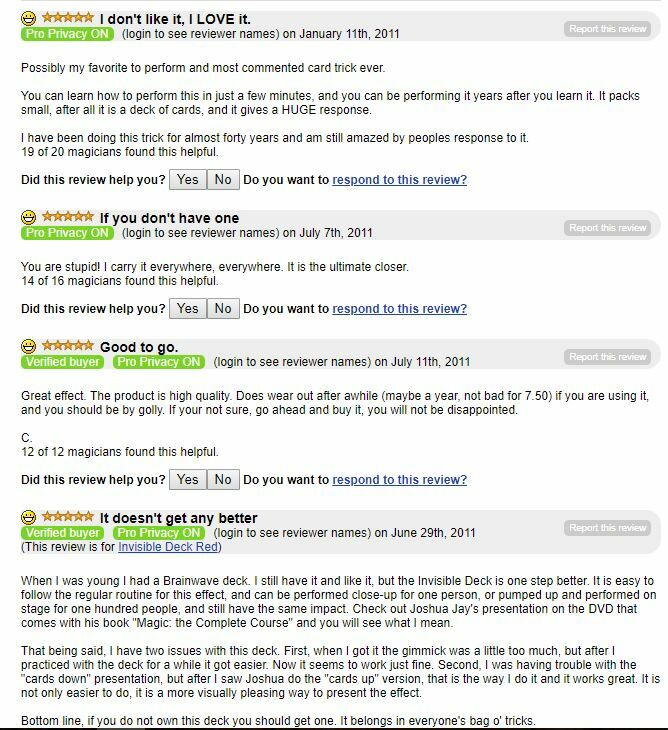 Penguin Magic stock it for around 7 dollars, but if you’d rather go with a site like Amazon, you can find it there too! You can learn this card trick on YouTube too, although that won’t be much help without the actual deck to go along with it. Are there any drawbacks to this effect? I won’t lie to you here. Like any magic trick, this isn’t actually magic, and so there are always going to be drawbacks. The biggest obstacle that stops this trick being a 10/10 is that you can’t hand the deck out to the spectator afterward for inspection (although it looks completely normal). One way of avoiding this is asking to do another trick straight after, to keep their attention away from the deck, or swap it for another deck while they are still reacting to the trick. Generally though, if you act natural and as if there is nothing special about the deck, there will be no need to do either of these. You will also need to be able to do a bit of mental maths, though nothing difficult- just addition of single digit numbers. There is a ‘math-free’ alternative to this trick called Cardtoon that you could try instead. Why is this one of the best tricks ever? Do you agree with my review of The Invisible Deck? Do you have any questions about it? Feel free to post them in the comments below! This looks like an incredible amount of fun. I’ve never had the patience to use real cards and actually learn slight of hand. However, the way you explain this trick along with the videos, it looks like I could create a routine within an hour. This would include presentation and actually performing the trick. It would be a thing to do during holidays. Thanks for explaining it completely. Yes absolutely, it really is up to you in terms of what you do with it! Hello there! My nephew loves to do magic the same to me. I don’t do magic that much anymore because I’m busy now. I already taught my nephew some tricks and now I’m looking for more. Luckily, I found and read your article about this invisible deck card trick. I know that I could do it but the problem is my nephew. Do you think that a 13 year old can do it? Great question! I would say absolutely he can; I first picked this trick up when I was 11 or so. As long as he spends enough time practicing and understands the mechanics of the trick, he should definitely be able to! Hi I enjoyed the way you explained this magic trick Though I haven’t heard of this magic trick before but looks as if I’d already known everything about it. I will give it a go to have some fun. It is a lot of fun! If you have any questions about it feel free to ask! Oh yea! This is going to make me look really good with my kids. The real trick or question for me is, am I going to be able to pull this one off on an adult? Being I’m goofy and silly. But with such a low investment it is sure worth the try. Yes! This one will definitely work on adults as long as you stay calm and don’t let nerves get the better of you! Thanks again. This was so cool to read about! My kids are really into magic. Do you think kids around the age of 12 will be able to do this trick? Having smaller hands I think may make it difficult, what do you think? Thanks for sharing! Yes, kids that are 12 should be fine with this one, as long as they spend a bit of time getting the method down first! It can be presented in so many different ways, the fun “shuffle the invisible deck” kind of way to get laughs, or the serious Derren Brown kind of mentalist approach. I get mine from Amazon too as they’re well made with fast delivery at a decent price. I LOVE using the Invisible Deck as a ‘Plan B’; if I’m doing a trick with some difficult sleights and I lose their card, no worries, simply hand them the Invisible Deck box and tell them their card has magically jumped from one deck to another. And there’s your recovery. Great insight, thanks for the comment! The Invisible Deck is certainly a great trick! It’s one of the rare trick decks that I have actually bought since I prefer to use a regular deck. The fact that the deck cannot be examined has never proved a problem for me, as I finish up by turning the deck ‘invisible’ with a deck vanish. No deck left to inspect. That’s a brilliant idea; I may just start doing that myself. Glad you enjoyed. There is only one problem, if I stay here much longer, I will not get anything done today, hehe. Thanks for putting all this up on the web!!! Thanks Red! Happy to hear you enjoyed! Keep in touch.